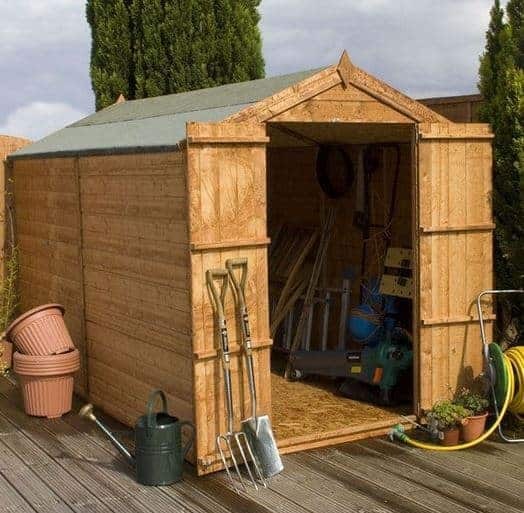 This incredible value shed from Waltons provides a substantial amount of space to store your gardening essentials. Created from high quality Shiplap cladding, the building benefits from a number of weather-resistant features. The roof is a classic example with its excellent water drainage qualities. As the rainwater hits, it runs straight down away from the roof and onto the floor below. A butterfly catch (or turn lock as it is also commonly known) is included on the double doors to ensure they stay securely closed when not in use. As the shed doesn’t have windows, it also ensures that your valuables are kept completely out of view. Free heavy duty sand felt is included in the cost and this will help to prolong its lifespan. Protecting it from not only rainwater, but falling debris too, the felt will ensure the roof lasts for many years. One thing that shows just how high quality this shed is, is that it is constructed with round edge framing. So it isn’t just the parts you can see that boast an impressive design. All in all this is an impeccable quality building with a long list of impressive features. Considering its low price, you are getting extraordinary value for money. 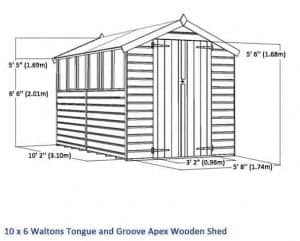 This is a large, low-cost storage shed designed by leading manufacturer ‘Waltons’. It benefits from the popular Apex style roof which is renowned for its exceptional water-resistant qualities. Due to its sloping design, rainwater quickly and easily drains off the roof, onto the floor below. It also has very minimal chance of running down the front and sides of the building, which ensures it is protected against damp related problems such as rot. A further advantage of this roof’s design is that it offers incredible interior height. Measuring 3.01m in depth and 1.90m in width, you should find the shed doesn’t take up too much garden space. This makes it a good option for the majority of homes. As mentioned, the apex roof gives the building an increased height, with its eaves reaching 1.58m and its roof reaching 2.07m tall. 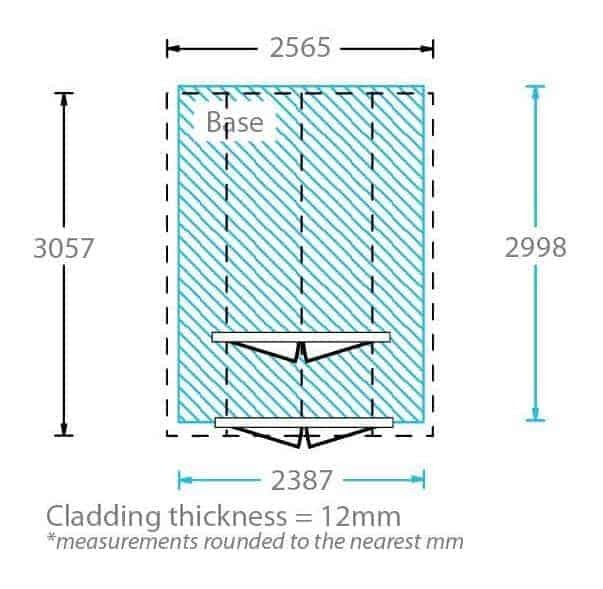 Finally its doors measure 0.96m wide and 1.68m tall, ensuring you have more than enough space to transfer your tools and equipment. What we find most impressive about this building is the fact that despite its affordable cost, it is created with high quality Shiplap tongue and groove cladding. Known to be featured on high-end sheds, this cladding style is the toughest, most durable and the most stylish type on offer. This particular shed is made from 12mm Shiplap cladding. You’ll find this is standard on the majority of sheds that use Shiplap and it provides a great, thick structure. It has a high level of water-resistance and is less prone to warping than other, cheaper types. All in all it provides fantastic durability. 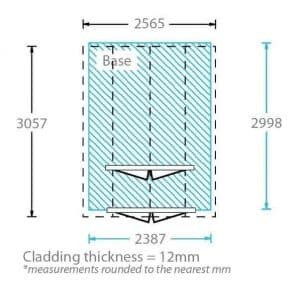 We aren’t surprised to see that the manufacturer has used 28mm x 28mm framing. This appears to be the industry standard. 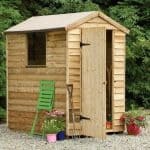 It supplies a fantastic support for the structure of the shed and will withstand daily wear and tear. 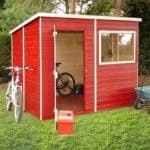 One thing that has helped to keep the cost of the shed down is the fact that it is supplied with a solid sheet material floor. It also has a solid sheet roof. The floor is made from 10mm solid sheet board which you may find a little flimsy. It is mainly designed to withstand medium weight storage. So if you are thinking of using it to store heavy items, we recommend you consider making the floor a little stronger. You will find that Waltons provide a free floor support pack. We’re impressed by this as it helps you to increase the floor’s strength without having to spend any extra money. The kit comprises of 12 floor joists which measure 2350mm long. They simply slot down between the solid sheet’s existing joists, making it incredibly simple to install. You also have the option to buy the extra strength floor support pack. More information can be found under the customisation section further down in this review. With Shiplap cladding we feel the best treatment option is a spirit based variety. It really penetrates deep into the timber, protecting it from the inside out. They are more expensive but they provide a much longer and stronger barrier against the elements. Water based treatments come in more colour varieties, but they will only cover the surface of the timber. You should also note that a spirit based treatment is required if you want to take advantage of the 10 year anti-rot warranty. You will also need to continue the treatments as advised by the manufacturer, usually on a yearly basis, in order to stay protected. 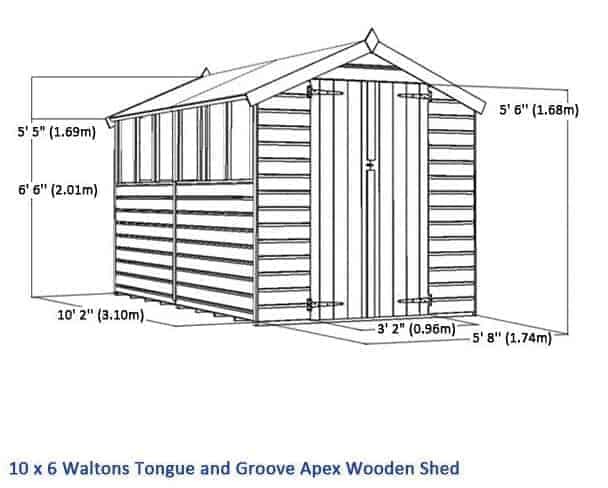 We were pleased to see that Waltons do actually provide a free treatment with the shed. You are given a free 5L tub of Golden Brown treatment. So this further adds to the money you save when you choose this model. The shed benefits from double doors, giving you a brilliant amount of space to access the building. There’s nothing worse than struggling to get through the door with awkward, heavy tools and equipment. Like most sheds, they also have a ledge design, making it very easy to install a hasp and staple. A turn button lock (butterfly catch) is also added to keep the doors secure when not in use. With no windows, the building won’t benefit from any natural light. This is only really a problem if you are hoping to use it as a workshop rather than a storage space. You would need to buy and install an electrical pack if you did want to include lighting. However, these are very expensive so that does need to be factored in. They also require installation which will cost even more money. You do get some good security features with this building. For example, its tongue and groove cladding provides natural thief-resistant qualities. Compared to overlap, it is pretty hard for someone to break through. However, one thing we feel could be improved upon is the level of security on the doors. They are fitted with a turn button lock. Now it’s easy to think this would keep the shed really secure as it contains the word ‘lock’. However, it isn’t actually a lock at all. It’s a simple catch that keeps the doors closed and stops them from blowing open in particularly windy conditions. 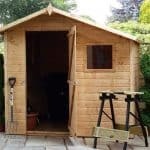 So you will need to invest in a lock if you want to make the shed properly secure. However, this isn’t going to cost a lot of money so it’s not really a major issue. What it lacks in security, it makes up for with privacy. There aren’t any windows so whatever is stored inside the building will be safe and away from prying eyes. Before talking about the extras available with this building, we feel it’s worth pointing out the free items Waltons gives you with this purchase. Firstly you will receive a free Golden Brown 5L treatment. This will take care of the treatment requirements for the first year so it provides excellent cost saving benefits. The second free gift you will receive is the floor support pack. This will strengthen the solid sheet material floor, ensuring it can handle slightly heavier storage. Most people will find this adequate enough to fit their needs, though there is an extra strength support pack available which you will find out more about below. There are a few notable additional options you have with this building. However, some of the customisation options and extras are more important than others. For example, one we highly recommend is the 10×6 Waltons Portabase. We can’t stress enough how important it is to make sure you are building the shed on a level, solid surface. The Portabase is created with high quality timber and not only is it incredibly solid, but it also helps to keep the shed off the floor. This means its chances of being damaged by rot and damp are minimised significantly. It also makes building the shed a lot easier. The weatherproof padlock at just £9.99 is also a highly recommended extra. It provides year-round protection against theft and is built with a very tough, durable frame. With a steel laminated body and thermoplastic weatherproof jacket, it is very resistant to the elements. It also comes with a hasp and staple for added security. As mentioned earlier, there is an extra strength floor support pack. Now as you are already given a standard support pack free with the shed, this may not be an essential add-on. However, we do recommend it if you want to store heavy tools, equipment, boxes or machinery. You can also upgrade the roofing felt. 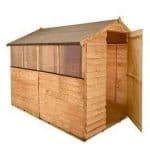 A heavy duty mineral felt is supplied with the shed and this provides a good amount of year-round protection. However, the superior felt helps to boost that protection thanks to its thick, fiberglass design. It is a small change, yet it provides much better protection which in turn gives you great reassurance. Created with tongue and groove cladding, the shed does offer exceptional quality. However, its overall design may not be to everyone’s preferences. The quality of the solid sheet flooring is what mainly prevents us from giving this shed a full 10/10 rating. However, the fact Waltons do provide a free support pack does improve this. The materials are built with durability in mind. 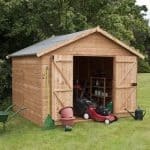 The only thing that lets it down for us, like many wooden sheds, is that it will require regular maintenance in order to ensure it lasts as long as it should. As well as benefitting from a large spacious interior, the shed also gives you the opportunity to make use of its thick cladding by installing internal shelving. You could also choose to hang heavy items from the walls via hooks if you needed to. Then there’s the added benefit that comes with the interior height added by the apex roof. All in all there is a great amount of space available with plenty of storage potential. Overall the building is easy to assemble, though it does require heavy lifting and patience. As it is a slightly larger building, you can expect you to take at least half a day to construct. The fact you need to buy extras does let this shed down for us a little in terms of its overall value. However, there’s no mistaking that you still receive a high level of value considering its low purchase price. Final Thoughts: If you’re looking for a basic yet high quality storage shed with plenty of interior space, this is a great option. Not only is it constructed from the very highest quality cladding, but it also comes at an extremely affordable price tag. The floor included may prove to be a little too flimsy if you want to store heavy boxes, machinery or tools. However, it is sturdy enough for moderate weight storage. 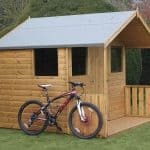 Whilst the windowless design does make the shed incredibly private, we still recommend you fit a better lock. The turn button lock included will keep the doors closed, but it won’t lock them. So if storing anything of value it is essential to invest in a high quality locking system.